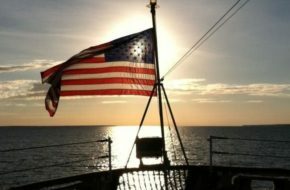 "Preserving the legacy of the Mackinaw WAGB 83 and her Crew"
The United States Coast Guard ICEBREAKER MACKINAW WAGB-83 is known as the “Queen of the Great Lakes” and “The Largest Icebreaker on the Great Lakes”. She was built as part of the war effort during World War II to meet the heavy demands of war materials and transportation during the winter months. Decommissioned in 2006, she now resides at her namesake home of Mackinaw City, Michigan, and is open for public tours, educational tours, overnight encampments and group events. 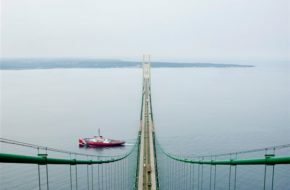 Informative displays and tour guides will tell you the story of the Mackinaw’s 62-year career of breaking ice on the Great Lakes and serving as a goodwill ambassador throughout the region. While aboard you will visit the Mess Deck, Captains Quarters, Bridge, Engine Room, Ward Room, Sick Bay and so much more. Aboard the ship is our “Ship’s Store” which has a wide array of nautical, military, and dedicated “Mackinaw” items to choose from. The store is open during regular tour hours and general admission is not necessary to visit only the store.